In a decision which has pro-abortion groups reeling, U.S. District Judge James Teilborg ruled that an Arizona law which prohibits abortions after 20 weeks is constitutional. The law is set to take effect on Thursday and pro-abortion groups plan on filing an emergency appeal. Teilborg also noted Arizona had provided "substantial and well-documented" evidence that an unborn child could feel pain by at least 20 weeks. The ruling marked a stinging legal defeat for abortion-rights advocates who cited the Arizona law as the most extreme example of late-term abortion prohibitions enacted in more than half a dozen states, and they vowed to immediately appeal the decision. Teilborg said Arizona's law "does not impose a substantial obstacle" to abortions generally and that Arizona had the right to enact such a measure. UPDATE: On August 1, the 9th Circuit Court of Appeals issued an injunction which delays the law from going into effect until after the case is argued. Under the two-page order issued by the appeals court, attorneys have until mid-October to present their briefs, and then the case will be placed on the first available argument calendar for a hearing. Representative Dave Camp, who represents Michigan's 4th Congressional District, recently announced he has been diagnosed with non-Hodgkin's lymphoma. Thankfully, the disease was caught early and Representative Camp and his doctors are very optimistic about his treatment and recovery. Our thoughts and prayers are with Representative Camp and his family. U.S. House to vote on legislation to limit abortion in Washington, D.C.
On Tuesday, July 31, the U.S. House of Representatives will vote on the District of Columbia Pain-Capable Unborn Child Protection Act (H.R. 3803). In the bill, Congress adopts findings that by 20 weeks after fertilization (if not earlier), the unborn child has the capacity to experience great pain. The bill prohibits abortion in Washington, D.C. after that point except when the mother's life is in danger. Pieces of legislation which are very similar have been passed in seven states and no court orders have blocked enforcement of any of those laws. Currently, abortion is legal in Washington, D.C. through all nine months of pregnancy. Today, the Michigan Senate Judiciary Committee voted 3-1 to move H.B. 5711 (also known as the Prolife Bus) to the full Michigan Senate. The measure would add regulatory and insurance requirements for some facilities that perform abortions. It also would enact screening requirements aimed at making sure women aren’t forced into having abortions, among other provisions. Sen. Rick Jones, R-Grand Ledge and chairman of the committee, defended the measure and said it's just “common sense” that abortion providers follow regulatory and inspection rules that other facilities follow. The Weekly Standard blog covered prolife efforts to pass the D.C. Pain Capable Unborn Child Protection Act. The Act would ban abortions past 20 weeks based on evidence that unborn children can feel pain at that point, and what could be more painful than an abortion? The Washington Surgi-Clinic, located just five blocks west of the White House, advertises on its website that it performs abortions 26 weeks (6 months) into pregnancy. The website of another clinic advertises second- and third-trimester abortions involving the “intercardiac injection of medication into the fetal heart” at a “private facility in the Washington, D.C. area.” All of this is perfectly legal. A Good Morning America/Yahoo! News web page is sharing the success of a British boy whose life was saved by the creation of a trachea from his own stem cells. The Detroit Free Press is carrying a story from USA Today which describes the brutal tactics used by family planning officials in China to kill the unborn children of women who violate the country's draconian one-child policy. As supervisor of family planning enforcement in Fujian province's Daji township, Wang Jinding says he knows the best way to kill the unborn babies of parents who want to keep them. "The key point is to separate the pregnant woman from her family members," he said in an interview with USA TODAY. That is exactly what Wang did in a case in April, enforcing the Communist Party's rules on family size. He had eight government workers kidnap a pregnant Pan Chunyan, 31, from her grocery store in Fujian city on the southern coast. Her husband, Wu Liangjie, was frantically raising the $8,640 fee required for a third child. Wu and a dozen relatives fought to try to see Pan at the government building where she was held. Rather than granting the family more time, Wang organized a police-led convoy of seven vehicles to take Pan to a hospital. There, Pan — who was eight months pregnant — was injected with chemicals to kill the child. She delivered a fully formed, but dead, son. During the fifteenth week of pregnancy, the baby’s hair pattern on her head is forming. Researchers argue whether her widow’s peak is the result of her genetic code or her own self-directed growth in the womb. A 24-year-old woman named Tonya Reaves is dead after having a dilation and evacuation abortion at a Planned Parenthood abortion clinic in Chicago. She had the abortion at 11 a.m. and was declared at 11:20 p.m. after being taken to a hospital. 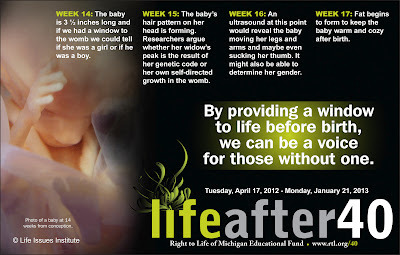 Prolife educational ads are airing on Detroit's WJR News Talk radio, 760 AM, from July 23 - August 6. You can hear the Right to Life of Michigan ads during morning and afternoon drive times, midday and on the weekends. We are excited to have prolife ads airing in Michigan to both educate and inspire people to learn more about the life-saving work of Right to Life of Michigan. If you would like to hear the ads and are not able to tune into WJR, visit our Life After 40 web page. In November of 2004, voters in California approved the creation of CIRM (the California Institute of Regenerative Medicine) to provide $3 billion in funding for stem cell research. CIRM was sold to the voters of California by promising miraculous cures using embryonic stem cells. Proponents of CIRM believed the almost unheard of funding levels would help California scientists cure disease after disease with embryonic stem cells. Fast forward 8 years and a review of CIRM's recent grants show that CIRM is slowly abandoning human embryonic stem cell research as it hopes to move research into clinical trials and have something to show for the billions given it. The California Stem Cell Report notes that in a recent round of grants worth $113 million, only one of the six grants involved embryonic stem cells and the one grant winner using embryonic stem cells was given the lowest scientific score of all the winning grants. U.S. House Committee votes to ban post-20 week abortions in D.C. Yesterday, the U.S. House Judiciary Committee voted 18-14 in favor of the District of Columbia Pain-Capable Unborn Child Protection Act. The bill would ban abortions past 20 weeks in our nation's capital because evidence indicates an unborn child may be able to feel pain. Below is a new downloadable fact sheet which explains H.B. 5711. House Bill 5711 is an omnibus bill, also known as the Prolife Bus. The purpose of the Prolife Bus is to hold the abortion industry to the same health and safety standards as other medical providers. Patients' safety must be put ahead of abortion profits. Please feel free to distribute this fact sheet as you wish. On July 16, Right to Life of Michigan PAC endorsed candidate Bob Costello was prevented from speaking at a forum for congressional candidates in the 14th Congressional District and was forced to leave the forum after attempting to speak. The forum was supposed to be an open forum for the Democratic congressional candidates of the 14th District but Costello (who is one of the five Democratic candidates on the ballot) wasn't invited. Costello, a prolife Democrat, was one of four congressional candidates who attended the event even though he was threatened with arrest if he attempted to speak at this event by the president of the Grosse Pointe Democratic Club. Costello believes his prolife beliefs were the reason he wasn't invited to the event and was prevented from speaking. The main focus of Costello's campaign is the protection of religious freedom which Obamacare's HHS mandate violates by forcing religious institutions which operate schools and hospitals to violate their beliefs by providing coverage for services they object to. The other candidates who attended the forum (Gary Peters, Mary Waters and Brenda Lawrence) remained shamelessly silent as their co-candidate was prevented from speaking. Get your personalized prolife ballot of RLM-PAC endorsed candidates here. During the fourteenth week of pregnancy, the baby is 3 ½ inches long and if we had a window to the womb we could tell if she was a girl or if he was a boy. During National Right to Life Committee’s recent annual convention, presidential candidate Mitt Romney addressed the crowd via video and promised to be a prolife president if elected. “If I’m fortunate enough to be elected this November, putting America back on the right track and getting Americans back to work will be my priority from day one. But I will not forget that a strong country needs more than a strong economy. It needs strong families and strong values as well. President Obama once said that decisions about abortion are “above his pay grade.” I’ll never be so cavalier about life. I will be a prolife president. I’ll reinstate the Mexico City Policy. I’ll cut off funding for the United Nations Population Fund, which supports China’s abhorrent One Child Policy. I’ll ensure that abortion advocates like Planned Parenthood get no taxpayer dollars. And I’ll reverse Obama regulations that attack our religious freedom and threaten innocent life. I’ll nominate judges who respect the Constitution, are proponents of judicial restraint and know the difference between personal opinion and the law. While Mitt Romney was pledging to support prolife legislation, foster respect for unborn human lives and end federal taxpayer funding of America’s leading abortion provider (Planned Parenthood), President Barack Obama’s campaign began airing a commercial (watch it below) with a much different message. The commercial attacks Mitt Romney for his prolife position and praises Planned Parenthood. The ad claims “every woman” is “troubled” by Mitt Romney’s prolife position and his belief that Roe v. Wade should be overturned. Roe v. Wade is the U.S. Supreme Court decision which legalized abortion through all of pregnancy in every state. Planned Parenthood provided 329,445 abortions in 2010. That’s more than1/4 of all abortions performed in the United States in 2010. 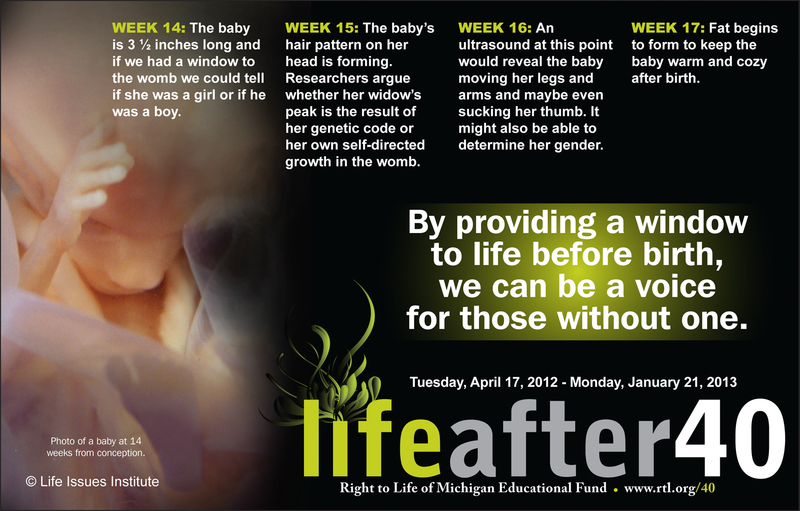 To learn more about prolife issues, visit Right to Life of Michigan at www.rtl.org. Planned Parenthood of the Heartland is being sued by a former clinic manager who is alleging that they committed millions of dollars Medicaid fraud. Planned Parenthood Federation of America performs more than 300,000 abortions a year and received $487 million from taxpayers in 2009-2010. Thayer, former manager of Planned Parenthood’s Storm Lake and LeMars clinics, has sued under both the federal and Iowa False Claims acts. The suit alleges that Planned Parenthood knowingly committed Medicaid fraud from 2002 to 2009 by improperly seeking reimbursements from Iowa Medicaid Enterprise and the Iowa Family Planning Network for products and services not legally reimbursable by those programs. During the 13th week of pregnancy, bones are beginning to harden in the baby’s head, arms and legs. In a blog post at the Corner, Michael New discusses prolife legislation recently passed in Michigan along with other prolife happenings and how Michigan has been a leader in passing life saving laws. The most visible debates over abortion tend to take place at the federal level. However, these recent developments in Michigan provide great evidence that pro-life efforts at the state and local level often make an important difference. Michael New is an Assistant Professor of Political Science at University of Michigan—Dearborn and will be one of the speakers at Right to Life of Michigan's upcoming annual conference. Watch in high speed as Wexford-Missaukee Right to Life's group in the Lake City Independence Day parade grew from 40 walkers at the start to more than 600 along the way! The banner which led their march read: "Each of the 800 crosses represents 4 abortions that take place every day in America." Should state legislature regulate Michigan's abortion industry? Bridgemi.com, a web site of The Center for Michigan has dueling editorials from Right to Life of Michigan's Pamela Sherstad and Lori Lamerand, the chair of Planned Parenthood Advocates of Michigan. These editorials were printed in the Grand Rapids Press on July 8. A part of Pamela's editorial is below. I attended a committee hearing that addressed serious abortion industry concerns. The Michigan Senate Appropriations Subcommittee on Licensing & Regulatory Affairs heard testimony on abortion clinic abuses in Michigan. To hear about the substandard medical practices of Michigan’s abortion industry was shocking. A few of the abuses noted during the hearing including: violation of bio-hazard waste disposal and medical record privacy laws; negligent operative and post-operative practices that have resulted in patient injury and death; and refusal to release medical records for patient use and patient follow-up care. From what I learned during the committee hearing, Michigan has a public health problem. In the twelfth week of pregnancy, fingernails have begun forming on the baby’s small fingers. Mitt Romney: "I will be a prolife president." During National Right to Life's convention, presidential candidate Mitt Romney appeared via video and addressed those in attendance, promising to be a prolife president. Part of his speech is below. If I’m fortunate enough to be elected this November, putting America back on the right track and getting Americans back to work will be my priority from day one. But I will not forget that a strong country needs more than a strong economy. It needs strong families and strong values as well. President Obama once said that decisions about abortion are “above his pay grade.” I’ll never be so cavalier about life. I will be a prolife president. If elected President I will work with you to foster respect for innocent human life with an understanding that a culture that fails to do so ultimately becomes a culture in which respect for all fellow human beings is diminished.